This drill is designed to increase your body’s ability to process lactate in your muscles. The goal is to increase your maximum sustainable power, as the majority of the work is below threshold. Wow! I taught this class yesterday. It was amazing and well received! Thank you! You could refer back to Ramp It Up 3-2-1 (Through the Doors) an ICA existing profile. This drill looks like fun Sara-thanks! So you are recommending only 30 seconds recovery before beginning the drill again? Ignore my comment-I just re-read the instructions-2 minute recovery sounds much more civilized! Sara. I took this drill for a test drive before I introduced it to my class. I thought it was an awesome and felt that it would be a perfect fit for my class. To say the least it was well received!! I am just wondering if you could build on this type of ride? Could you progress to a three, three, two ride?? I’m glad your class liked the drill. You could increase the time spent at each effort level, but make sure your participants can handle two minutes above functional threshold. It’s not easy and takes conditioning. Remember, it’s not two minutes pedaling as fast as you can. Going above threshold takes your breath away and makes your muscles burn as they use up oxygen. If you do go for longer efforts, make sure the time spent in recovery between each set is longer. Giving it another shot later this week for my evening class. Here is the one minute drum track…. 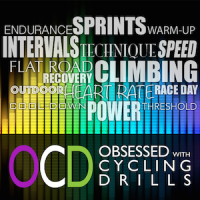 I’ve done the 3-2-1 drill before, but simply as a flat road….and only 2 intervals. I didn’t want to bore some of them. 🙂 But, wow, you’ve given me new ammo! So, if you did this as an entire class would you do, say 2 or 3 flat road intervals, then 2 or 3 hill intervals….or alternate to keep them engaged? Or would you put some sort of different drill in the middle as a transition from the flat road to the hill? I’m going to try to put this together for next week’s classes. Thanks so much for expanding my thought process with this drill! The idea of having that one minute of just drums is great. Decyfer Down’s Ride with Me is just over 3 minutes, Art of Dying’s Get Thru This is a little over 2:40. Or, you can go with a full 6 minute song like The Crystal Method’s Keep Hope Alive. You’ll keep your class engaged with transitions from sub-threshold flats right into a threshold climb. Use music that keeps the energy alive. I am thinking about using “Masters of the Universe” by Juno Reactor. Masters of the Universe, holy wow! That’s a new one to me and I must have it. I have another Juno Reactor song coming for Friday Favorites – keep an eye out for it.